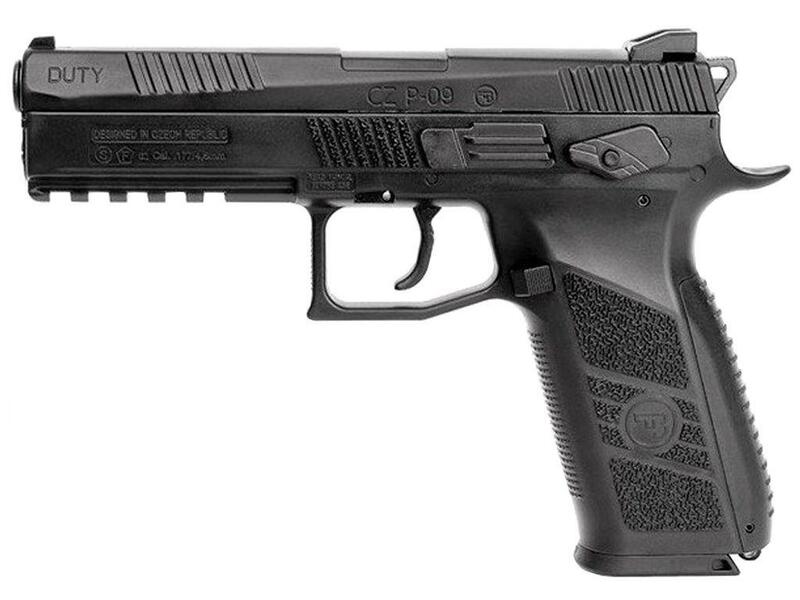 ASG CZ P-09 Duty Blowback Pellet Pistol | ReplicaAirguns.ca | Easter Weekend Sale! Trigger Pull: The trigger pull on the ASG CZ P-09 Duty is similarly to the Umarex PX4 Storm and the Gamo Blowback Pellet Pistols. 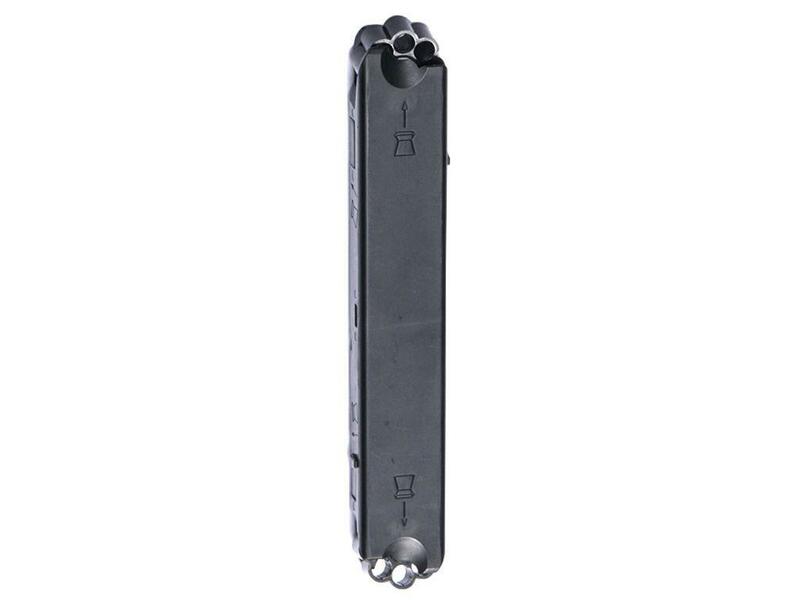 All three Pellet shooting pistols use double sided stick based rotary magazines that hold 8 rounds in each end. They also all shoot with a single action hammer (set to the cocked position by the blowback action) while the first stage of the trigger rotates the rotary magazine and indexes a round. So I would consider them to be single/double action hybrids. The trigger pull in general is not overly heavy but it is long and there are noticeable sticky points when the magazine is rotating and the hammer is being released. Accuracy: During my field shooting test I decided to allocate 8 rounds for each test station since the magazine holds 8 rounds on each end. During my Chrony test the ASG CZ P-09 Duty started out in the high 300's and then dropped to the low 300's with an average 8 shot velocity of 334 fps. From the 30 foot mark shooting on a paper target using a semi rested position (sand bag up front and standing in the back), I was impressed to see 7 of my 8 shots all hit within 1 inch of each other while the oddball got away a bit and extended the grouping out to about 2 inches. It did shoot a hair low and to the left a bit but not too extreme. Build Quality: Overall I found the CZ P-09 to have a good solid build quality to it, everything functioned as it should with the exception of the front sight vibrating lose and almost popping out. I would recommend checking the front sight on your CZ P-09 and making sure to super glue it in place if you find it to be loose or you could lose it while shooting the pistol and once it falls off I doubt you would find it again? The only other questionable design is the way the CO2 cover fits on this pistol. It kind of clips in place but seemed like it could loosen up over time. Realism: The ASG CZ P-09 Duty is a close replica to the real steel CZ P-09, the only real giveaway is the ejection port that is not cut out but rather moulded into the slide. I would have liked to have seen an open ejection port like the Umarex PX4. The CZ licensing and recessed barrel do help to make this a very believable Pellet shooting replica. Ejection port is not cut out. Comments: It's nice to see another pellet shooting blowback replica air pistol and one that has really great accuracy as well. 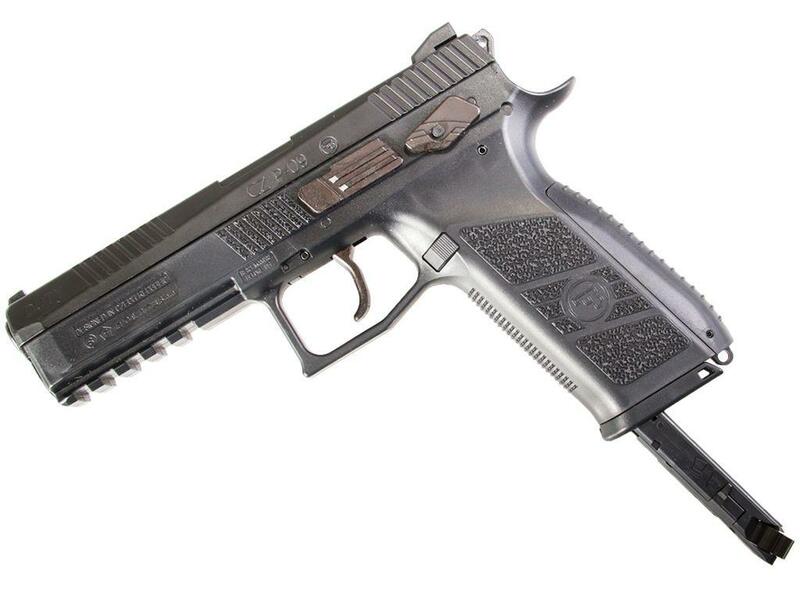 There are a few shortcoming on the ASG CZ P-09 Duty like the moulded ejection port and the kind of lose fitting CO2 cover but overall the ASG CZ P-09 Duty is a blowback pellet pistol worth looking into. In terms of looking the part of a CZ P-09 Duty, the ASG pellet version does this very well with its full CZ licensing and attention to detail throughout. michael's review, as well as that of the user above, pretty much sums up my experience with this pistol. Let's just say the following:1. This handgun is accurate, very accurate for a so-called hybrid (BBs and pellets).2. Don't use it as a hybrid. This gun shoots pellets beautifully; don't mess up the bbl with BBs.3. This handgun challenges you to attain the accuracy it's capable of; the blowback is not tame.4. 0ne-inch groups at 10 metres is not a fluke; they are consistently repeatable with practice.5. The cost/pleasure value is very high.You might want a second so others can enjoy as well. 6. If you're in for picking nits, this gun has a couple of minors. Check out Michael's review. Wow, an incredible pistol !!! As a person who had an interest in guns since childhood and been shooting since then as well i like to think I know a bit about guns and how they're made and operate, and all I can say about this CZ P-09 DUTY is WOW and WOW, superb construction, incredibly accurate, extremely enjoyable to shoot and great value for the money, A++ and 5 stars, and these folks at replicaairguns.com know their guns and know their business, not to mention the great reviews, overall very impressed. Thank you very much replicaairguns.com. http://www.ReplicaAirguns.com - ASG CZ P-09 Duty CO2 Blowback Pellet - BB Pistol Table Top Review. It's nice to see another Pellet shooting blowback replica air pistol and one that has really great accuracy as well. There are a few shortcoming on the ASG CZ P-09 Duty like the moulded ejection port and the kind of lose fitting CO2 cover but overall the ASG CZ P-09 Duty is a blowback pellet pistol worth looking into. In terms of looking the part of a CZ P-09 Duty, the ASG pellet version does this very well with it's full CZ licensing and attention to detail throughout. http://www.ReplicaAirguns.com - ASG CZ P-09 Duty CO2 Blowback Pellet BB Pistol Field Test Review. I finally got the opportunity to shoot the ASG CZ P-09 Duty CO2 Blowback Pellet/BB Pistol that I saw back in January of this Year while I was attending the SHOT Show in Vegas. 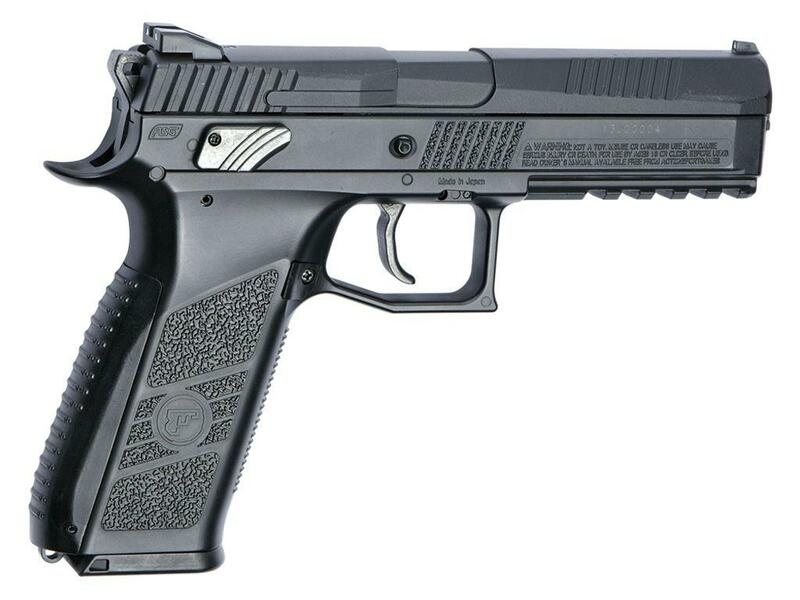 Essentially the ASG CZ P-09 Duty is built similarly to the Umarex PX4 Storm and Gamo Blowback Pellet Pistols. 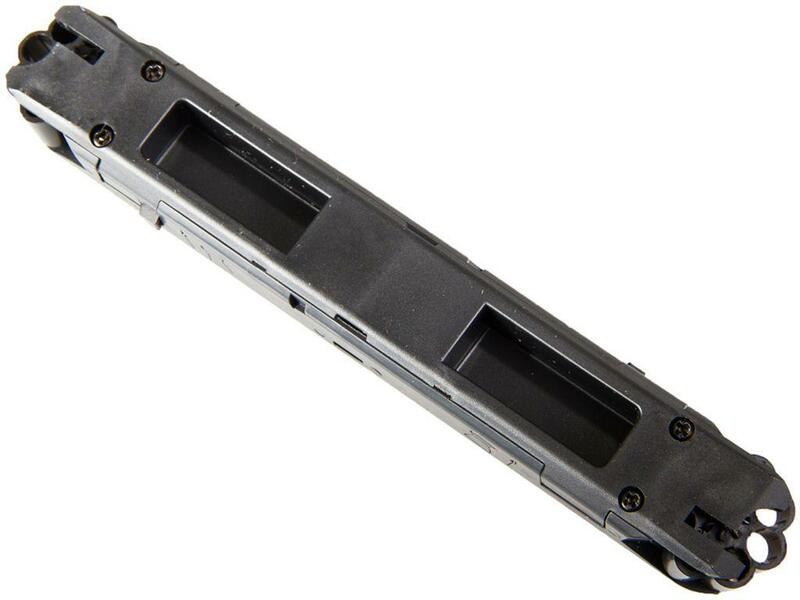 They all use double sided stick based rotary magazines that hold 8 rounds in each end. They also all shoot with a single action hammer (set to the cocked position by the blowback action) while the first stage of the trigger rotates the rotary magazine and indexes a round. So I would consider them to be single/double action hybrids. Anyways, on with this field test shooting review... As per my normal field test shooting reviews, I shoot some rounds through my Chronograph to get an average fps rating and I also step back 30 feet from a paper target and use a semi rested position to place a series of rounds downrange. I decided to allocate 8 rounds for each test station since the magazine holds 8 rounds on each end.